This week the Portuguese media is convinced that Benfica’s Victor Lindelöf is close to completing a €35 million move to Manchester United. The 21 year-old centre back made some waves for Sweden in Euro 2016 and enjoyed a successful 2016/2017 campaign for Rui Vitoria’s title-winning Benfica side. The Swede has now seemingly emerged as a top centre-back target for José Mourinho. With that in mind, we wanted to find out more about him so we sat down with Alfredo Fumacas from the Benfica Podcast to gain some real insight. UR: Hi Alfredo! Thanks for having a chat with us. Could you please introduce yourself and your podcast? AF: My name is Alfredo Fumacas and I am the host and creator of the Benfica Podcast, the only English language podcast exclusively about Benfica. It is published weekly and it was launched in January 2012. UR: Alright, Victor Lindelöf What can you tell us about his background? AF: Victor arrived at Benfica in the summer of 2012 from Swedish club Vasteras. Just short of turning 18, Lindelöf was initially part of Benfica u19s set up, but was quickly promoted to Benfica’s B team, which competes in the Portuguese Second Division. Lindelöf finished his first season with 4 games for the U19 team, and 15 for Benfica’s B team, 13 of them as a starter. In the 13/14 season Lindelöf became a main fixture in Benfica’s B team, his good performances for the B team earned him his first appearance for Benfica’s main team. An undisputed starter for Benfica’s B team, Lindelöf capped off his 14/15 season with a U21 European title for Sweden, beating Portugal in the final. With a new era being ushered in at Benfica in the 15/16 season with the appointment of Rui Vitoria, and a change in paradigm by the club in wanting to take advantage of their academy, Lindelöf was promoted to the A team. The Swede’s playing time was initially limited to League Cup games, but on January 31st, with Benfica’s centre back depth affected by injuries, Lindelöf featured on the bench and would eventually get his chance, coming into the game for an injured Lisandro Lopez at the end of January. Lindelöf would take full advantage of the opportunity, cementing his spot in the the back along with Jardel. The pair would be Rui Vitoria’s choice for the rest of the season where Benfica would clinch their third straight domestic title. Lindelöf would also feature in all 4 matches of the Champions League knockout stage against Zenit and Bayern Munich. This past season, Lindelöf along side veteran captain Luisao, has been been one of the first names on the team sheet – helping Benfica to their first 4th straight title in the club’s history. UR: It was an excellent season for Benfica as the Eagles claimed yet another Primeira Liga title. How would you assess Lindelöf’s performances for the Portuguese champions this campaign? AF: Lindelöf’s role in Benfica’s season was extremely important, as he helped Benfica to the best defensive record in the Liga Nos. With the return of Luisao, Lindelöf was shifted to the left side of the centre back pairing, but even with the shift to his weaker foot side, there was little to no change to Lindelöf’s performances. Lindelöf’s performances surpassed the previous year’s, and established the young Swede as one of the top centre backs in the Liga Nos. He was in the top three of best pass completion percentage with 91%, and he was also in the top three of passes completed in the opposing team’s midfield – the only defender in this group of three, the other two being holding midfielders. Lindelöf’s growth this year can not only be attributed to his abilities, but also having Luisao next to him. While Lindelöf provided the speed and athleticism of a young player, Luisao complemented Victor’s game by providing positioning guidance to the youngster. Together they completed each other to help Benfica shutdown the opposition. UR: In Eric Bailly José Mourinho a no nonsense stopper who seems likely to emerge as one of Europe’s top centre-backs over the next season or two. United; however, had trouble this season bringing the ball out from the back due to a lack of ball playing centre-backs within their ranks. Does Lindelöf have the requisite ability to play the ball and step out with it into the midfield? AF: If there is a distinguishable trait in Lindelöf’s game it is how comfortable he is with the ball at his feet. Whether bringing the ball up the field, or penetrating defensive sectors with an accurate pass into the final third, even with his weaker left foot. When it comes to aerial ability, Lindelöf is not the most dominant centre back, but it will improve as he will learn positioning, and quicker situational reads. Lindelöf recently added a new weapon to his arsenal, free kicks. Unbeknownst to even the closest followers of the team, Lindelöf did this to Benfica’s cross town rivals Sporting. Lindelöf’s tying goal would help Benfica remain atop of the table. UR: Are there any noticeable weaknesses in Lindelöf’s game? AF: The biggest weakness in Lindelöf’s game is perhaps his inexperience, perfectly normal at this stage of his maturity as a player. The occasional positional mistake, or mental breakdown, are the only chinks in his armour, which he offsets with his calm demeanour, quick re-focus, and willingness to leave it all on the pitch. 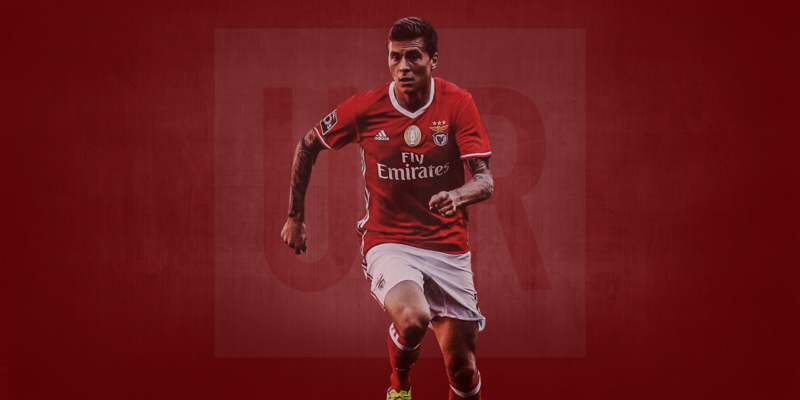 UR: And finally, do you think Lindelöf is ready for a move to a top European club like Manchester United this summer? AF: Lindelöf is definitely ready for a big move to a top league, unfortunately for Benfica. If he does in-fact land at United, I believe his adaptation time will be very short, and it will take him very little time to crack the starting 11, and within a couple year’s time be one of the premier centre backs in the English Premier League. We would like to thank Alfredo for his insight. You can keep up with him on Twitter here. Also be sure to check out his podcast here. You can also keep up with the conductor of this Q&A, Ravi, on Twitter here.